President Barack Obama announced on Wednesday a blockbuster shift in U.S. foreign policy -- for the first time in half a century, the U.S. and the island nation of Cuba, run by the long-time Communist government under the control of the Castro family, will take major steps toward normalizing diplomatic relations. Since 1961, the U.S. has had no official diplomatic contact with Cuba; indeed, the U.S. does not even have an embassy in Cuba's capital city of Havana. This change in U.S. policy toward Cuba, a policy that was sometimes accused of being a Cold War relic that outlived that tense era, is something Americans have been supportive of in the past. In 2009, the last time Gallup asked about this question, 60% of U.S. residents said they favored normalizing diplomatic relations with Cuba. This reading was consistent with Americans' attitudes on this subject for an entire decade -- for 10 years in a row from 1999-2009, a majority of Americans consistently favored normalizing relations with Cuba, suggesting that public opinion is very stable on this issue. Polls conducted earlier this year by the Atlantic Council and The New York Times showed that this majority support for re-establishing relations with Cuba has continued. The more controversial move was ending the long-standing trade embargo against Cuba, a policy not entirely overturned by Obama's announcement and one that would need congressional support to fully repeal. In 2009, a bare majority of Americans said they supported ending the trade embargo. More troublesome for Obama is the fact that Republicans and Democrats feel mightily different on this matter -- Democrats were nearly twice as likely, in 2009, to support normalizing diplomatic relations with Cuba (72%) than were Republicans (42%), and Democrats also supported lifting the trade embargo by higher percentages over Republicans, 54% to 44% (interestingly there is a significant drop in support for lifting the trade embargo among Democrats relative to their support for restoring diplomatic relations, while Republicans support both proposals in equal, sub-majority levels). With Republicans set to control both chambers of Congress for the final two years of Obama's presidency, their legislative dominance could quickly deflate Obama's new foreign policy aim -- if the prevailing partisan sentiments measured five years ago still prevail. And there is reason to think it will, at least to some degree. Past Gallup research shows that the biggest partisan divide on favorable opinions toward foreign countries occurs when asking about Cuba. 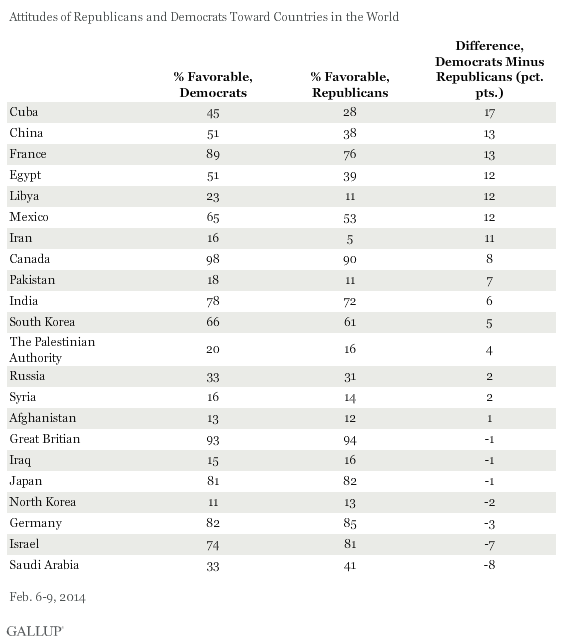 Earlier this year, Gallup found that 45% of Democrats viewed Cuba favorably compared with 28% of Republicans, for a difference of 17 percentage points -- nominally higher than any other country included on the survey. Consequently, a number of prominent Republicans -- including House Speaker and incoming Senate Majority Leader Mitch McConnell -- have already spoken out against Obama's decision to begin normalizing relations with Cuba. This is all to say that, while Obama is taking actions that Americans broadly seem to favor, judging by past polling, this doesn't mean he won't face truculent congressional defiance. This may be one of the first major legislative battles of 2015.